I'm always trying explain to folks that people in Kumamoto* are different. 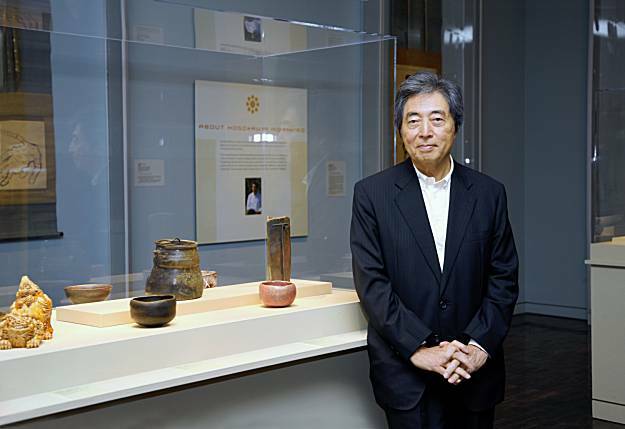 Well, here's a good example—Morihiro Hosokawa, a descendent of warlords who served as a reformist governor there, then left politics to become, of all things, an apprentice potter who is now exhibiting his own elegant work along with his family's extensive collection. The list of politicians who have made this career move must be a short one indeed. *Kumamoto is the prefecture—equivalent to an American state—that contains the Aso region, home of Mellow Monk tea. The former gov posing with his works of art.